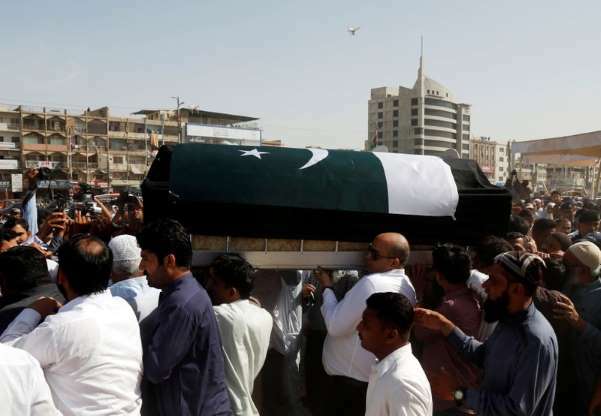 A Pakistani exchange student killed in a mass shooting in Texas last week was buried in her home town of Karachi on Wednesday, her coffin draped with Pakistan's green and white flag. Sheikh's body arrived in Pakistan on Tuesday night and the funeral was held at a graveyard near her home in Karachi in the middle class Gulshe-e-Iqbal neighborhood. "This innocent girl had gone to brighten the name of Pakistan," Amir Khan, a senior leader of the Muttahida Quami Movement party which forms the city government in Karachi, told reporters at the funeral. "But due to bad luck in a country that accuses the world of terrorism, she became a victim of terrorism herself." Sheikh's father, Aziz, said earlier the thought of school shootings had never crossed his mind when he sent Sabika to study in the United States. Sabika was part of the YES exchange program funded by the U.S. State Department, which provides scholarships for students from countries with significant Muslim populations to spend an academic year in the United States. She was due to return to Pakistan on June 9. "I have no words to express my feelings," family friend Mohammad Ali said after the coffin arrived at the family home. "It is a great loss to Pakistan. She wanted to do a lot for this country."